Other topping ideas include… diced tomatoes, parmesan cheese, broccoli, and probably a lot of other leftover things you have in your refrigerator. 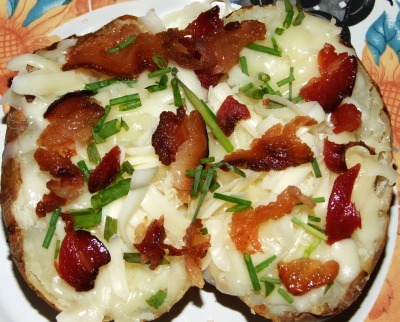 We usually eat loaded baked potatoes as a main dish, since eating them WITH other food seems like WAY too much to eat at one sitting, but your mileage may vary of course. I made lasagna over the holidays, including homemade lasagna noodles. 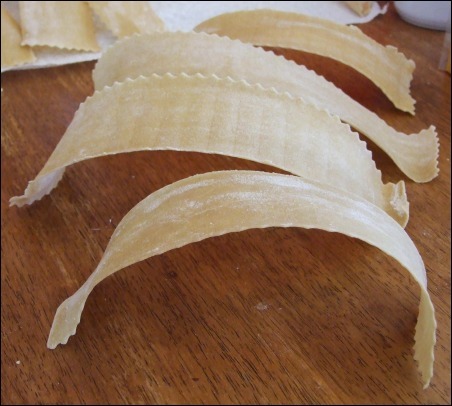 I’ve made them a number of times, but have never let the fresh lasagna noodles dry flat on the table (on paper towels) overnight before. When I saw them in the morning I started laughing…. Apparently, they dried on the top, open to the air, much faster than on the bottom, or at least started that way and once they were mostly elevated off the paper towels continued to dry in arcs. They seemed a little more brittle to the touch than noodles that were only dried for a little while, but they cooked up just fine in the hot water. Anyway, I just couldn’t resist sharing this image. Silly dried pasta! The Double Down By KFC: A Sandwich NOT! Comments Off on The Double Down By KFC: A Sandwich NOT! I enjoy a good chicken sandwich as much as the next guy. In fact I generally won’t order grilled chicken at a restaurant because they’ve usually been on the grill for several hours and taste more like warmed over shoe leather than anything resembling meat. The new Double Down by KFC though, while I have not tried it, quite frankly repulses me. The “sandwich” consists of two breaded chicken fillet patties in place of bread or a bun, filled with cheese, bacon and the Colonel’s sauce. I freely admit that I’m not much of a KFC fan to begin with. They use way too much MSG in their food so when I eat it I end up with an insatiable thirst, a headache and sometimes my hands break out in a rash. This entry to me is not a sandwich though. Sandwiches start with bread and good sandwiches start with good bread. 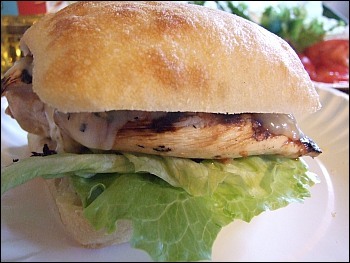 One of my favorite chicken sandwiches used to come from the old Wolf’s Deli in downtown Manhattan. It had a breaded chicken breast on a kaiser roll, with bacon and swiss cheese and barbecue sauce. Not too different from the entry above in terms of ingredients, but in my mind far more appetizing and attractive than that greasy monstrosity above. Well, we’re on the road, on our way to our new home in Upstate NY. We haven’t had much of a chance to eat at independent restaurants along the way (a bit hard to find along interstates although occasionally we luck out), but tonight we did, when we stopped in Chesterton, Indiana! We ordered pizza from a place called Gelsosomo’s Pizzeria (the other two choices were Pizza Hut and Little Caesars) – and it’s delicious! We got a simple sausage pizza and although the round pizza was cut into a grid pattern instead of the classic slice formation, it’s still extremely tasty. It arrived hot, and in fact, I’m going to get another slice now and stop writing this post. Tah! 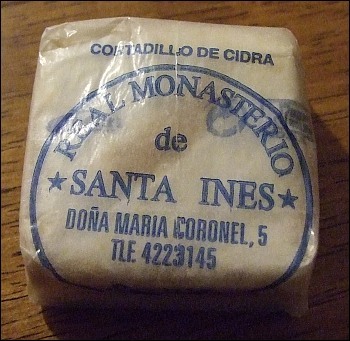 The sausage had a fantastic flavor and texture, the bread sticks were excellently crunchy, and the ‘nun cookies’ finished things off with a sort of fig-newtony type flair, but with a fruit that was lighter in color and taste. We ate them all like a snack, and washed them down with a bottle of fruity white wine, which complimented things well. All around it was a night of fantastic food tastery! 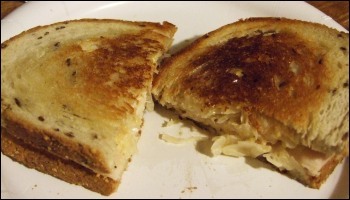 Every so often I remember that I love Grilled Turkey Reubens and that I haven’t had one in a LONG time! So assemble the sandwich as you like, butter the outsides of the bread, and then grill until golden brown! That’s not the most exciting picture, and you can see that it’s browned a bit unevenly, but I was in more of a hurry to EAT the sandwich than to spend time on a pretty presentation – hah! It tasted even better than it looks here, if that helps. Take a piece of bread, layer turkey, some saurkraut, slices of cheese, and top with dressing. Complete with another slice of bread. Spread butter on outside of each bread slice and grill sandwich in a (nonstick recommended) frying pan on low heat until bread is golden brown and crispy and cheese is melted. 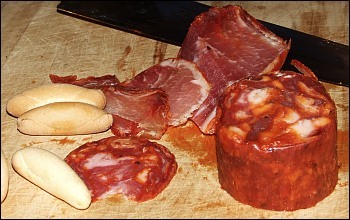 Cut in half and serve. 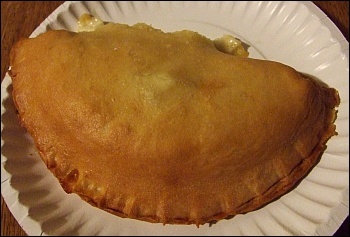 We made calzones again the other day – this time stuffed with ricotta cheese, mozzarella cheese, and some fresh (pan fried) italian sausage coins – yum! If you want to play with a little yeast and dough, here’s the recipe to make your own calzones. This is a really easy recipe for a very tasty sandwich! Marinate boneless chicken breasts in Italian Dressing overnight. Shake off excess dressing and grill the chicken. Open ciabatta rolls and dress with mayo, lettuce, and thinly sliced tomatoes, then chicken, then top with a slice of jalapeno jack cheese and wah-lah! Serve with a side of potato chips or potato salad if you like. 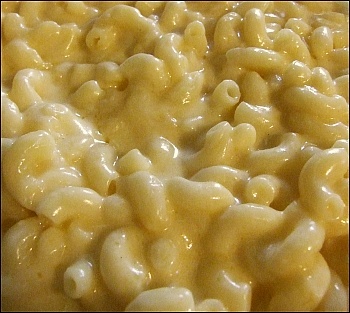 Just for variety, I made macaroni and cheese in a different way than usual, by making a creamy cheese sauce first. Used half pound of elbow macaroni and doubled the cheese sauce recipe below, pouring it over the cooked macaroni, in a large casserole dish. Mix in about 1/2 to 1 cup of grated parmesan cheese for extra kick, then bake for a half hour on 350. Next time I’ll use ALL extra sharp cheese, no Monterey Jack, as the extra amount of milk really made it a bit milder than it needed to be. Still, it’s always fun to try something new! And it’s macaroni and cheese, can’t go wrong with mac and cheese! Melt butter in saucepan and remove from heat. Stir in flour and seasonings. Gradually add milk, stirring until well mixed. Cook over low heat, stirring constantly, until thickened and smooth. Cook for 5 minutes longer, and then add cheese. Stir until smooth and well blended. 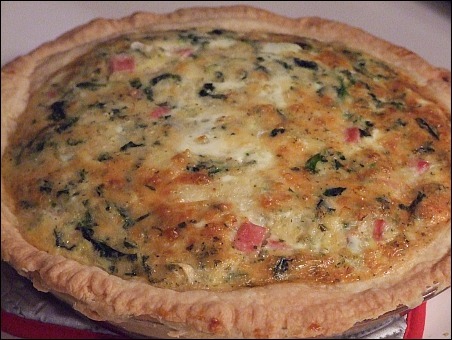 Serve with pasta or vegetables. Note: To make twice as much, double everything in recipe except only use 2 cups of milk instead of doubling the regular amount. Also, if you use a mild cheese like Monterey Jack instead of sharp cheddar this recipe makes a good base for cream casseroles.